Horn Lake Mississippi – Let's Go RVing! Woke up about 6:30 after a good night’s sleep. It was raining when we went to bed but I could just barely hear it, just enough to put me to sleep. For the most part going to sleep hasn’t been a problem on this trip. I usually turn on a podcast and fall asleep listening to it. Knowing we had a lot planned today we got ready and left a little after 10:00, unusual for us! We went to the Visitors Center first and actually got very little information. They do not have a trolley tour here and the bus hop-on just goes to various places with no information. The bus tours last anywhere from 2 to 6 hours and I knew we didn’t want to do those so we found out that there was a lot of parking downtown so we headed there. 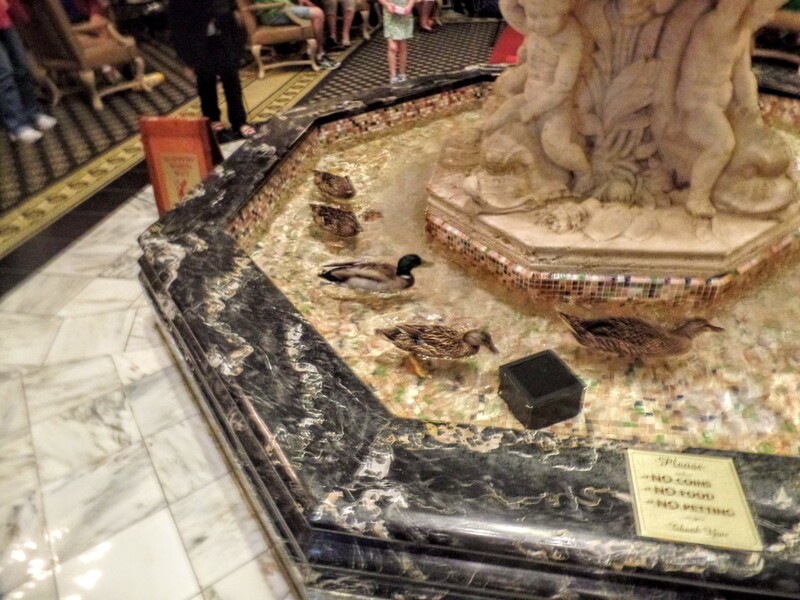 I especially wanted to see the ducks at Peabody Hotel plus I just wanted to see the hotel. Indeed it is beautiful, well worth the effort to get there! According to one of the waiters the crowd today was a little small but I thought there were right many people there. The ducks came off the elevator and went right straight to the center where the pool is. They will stay there until 5:00 when they will return upstairs. Amazing. We looked at some of the shops and I found a pair of jeans I liked. They were $170. Guess what – I didn’t get them. I did get a t-shirt with the ducks on it. After that we wandered around not really knowing where we were going. I wanted to go to Beale Street so I used my phone GPS to find it. We recognized it immediately when we got there. As the day wore on the street got busier and busier. I’ve never been to New Orleans but I think it must be something like Beale Street except a notch or two higher. After walking around a bit we decided to have some ribs. 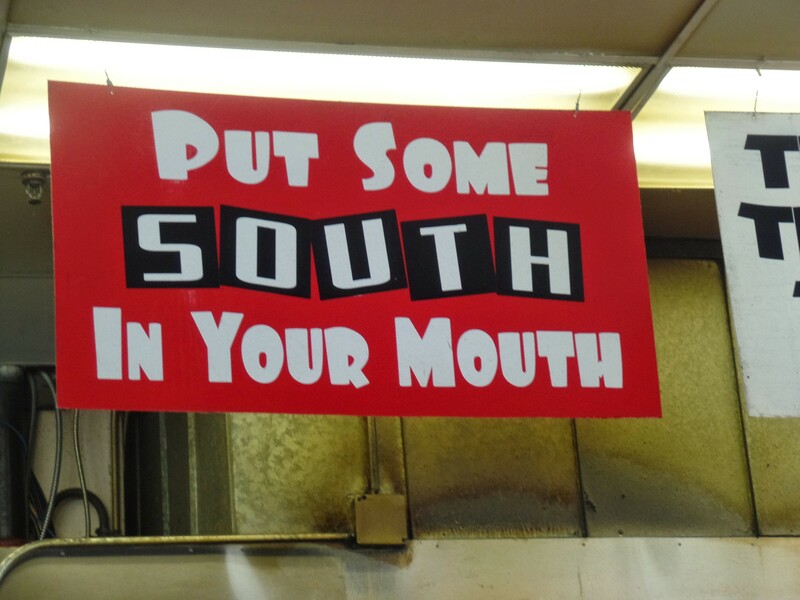 After all Memphis is famous for its ribs. We ate at Blues City Café. I got a half rack with red potatoes, slaw and baked beans and Jerry got the same thing except he also got fried catfish. It was good and I didn’t even get my hands messy! 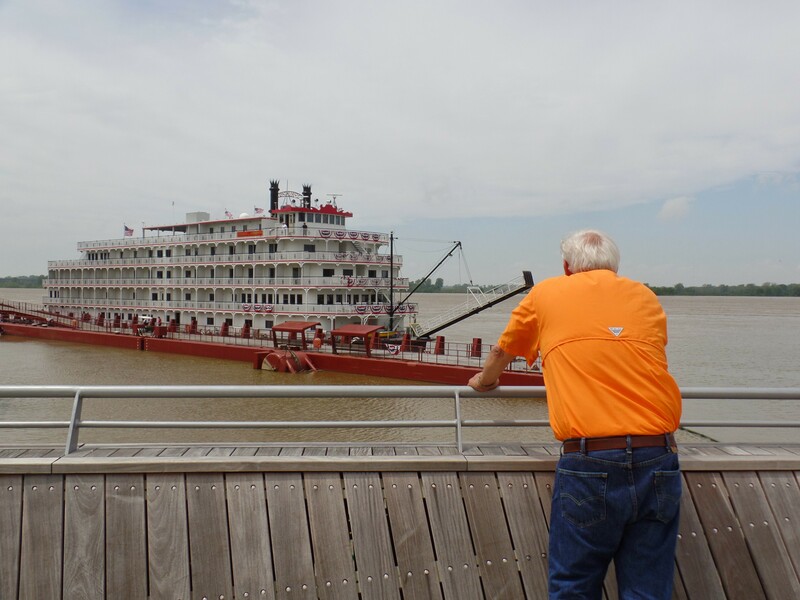 Our next stop was the waterfront, the mighty Mississippi. We saw a huge “steamboat” and then a couple of smaller ones. I think the smaller ones were what I had thought about taking a dinner cruise on. We also saw the Bass Pro Shop Pyramid which is scheduled to open Monday. Hopefully we can get back down there to see it as it is amazing. 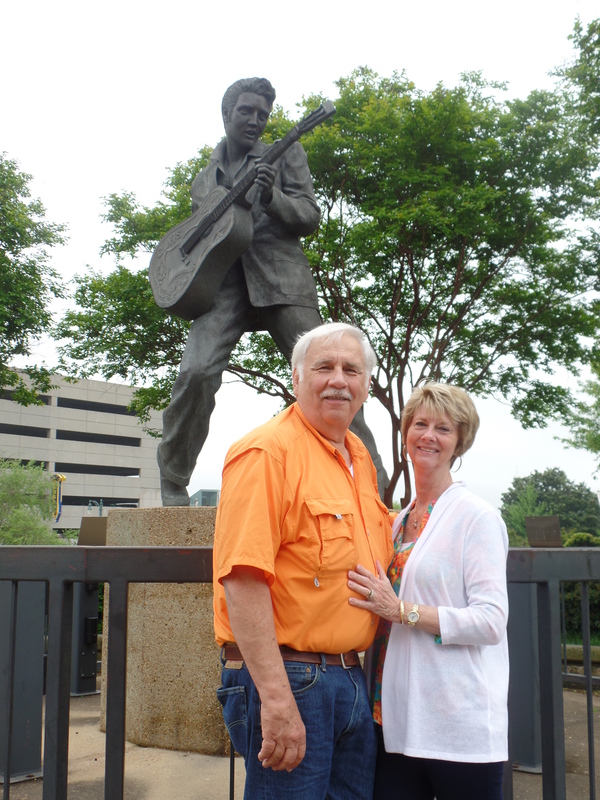 We finally found our way back to the car and decided to go to the Rock n Soul Museum. Actually we were very close to it when we were on Beale Street as it is on the corner of Beale and 2nd. We found some free parking and walked to the museum. We spent a couple of hours in there and it was fascinating. It began with the start of soul music and went on including the hillbilly music. There was an emphasis in the beginning on the sharecroppers and the difficult plight they endured. It really is almost unimaginable. It was another audio tour so after watching a brief film we were able to tour at our own pace. Initially there weren’t many people there but it began to get more crowded as the day went on. As I listened to the music through my headphones I had to be careful not to sing out loud but I’m sure I was harmonizing some of the time. Glad no one knew me! When we got back out on Beale Street it was really rocking. I expect Saturday night will be even more riotous. We were both pretty tired by then. I only had two more things on my “to see” list today, Sun Studio and the Pink Palace. Jerry was not interested in going to Sun Studio since we had already seen a recording studio in Nashville plus we had seen a lot of duplicate information at the museum today and the Pink Palace closed at 5:00. Since it was already 4:00 we decided to call it a day. We stopped by Best Buy and bought an adapter so I could transfer the pics from the camera to the laptop and Jerry finally found a lens cover. After a brief stop at Krogers we came on back to the campground. Jerry got the chairs out and we went outside but I couldn’t stay as it was so windy. I came in and got a load of clothes going. By the time they finished I got another load going and went outside to join Jerry. We went on a brief walk around the campground. This is probably one of the nicest campgrounds we’ve stayed in. It’s quiet and the sites are cement and level. There seems to be some full timers here as a number of people have quite a set up plus they have pretty big grills, not camping grills. If it had decent Wi-Fi I’d give it a 10 but the Wi-Fi is pretty bad. After our walk we came in, finished washing, drying and folding the clothes and then vacuuming after a Kleenex exploded in the washer! What a mess. It’s been nice having a quiet evening and tomorrow should be fairly easy. We’re going to the Full Gospel Church and it doesn’t start until 11:30 so we’ll have a slow morning. Not quite 9:00 and I’m turning in!